Having just rang the travel agents who took our booking to explain the letter received from Haven head office they have now given me a number to ring for Customer Solutions. I rang the number and the lady is going to review all letters that have gone between ourselves and send a covering letter to Haven themselves, she has said if this fails they will forward the case to ABTA who will deal with it accordingly. hi guys well some of you might know i had big problems with pc world when i bought my laptop a month ago when they charged me for things i was told were free i had big problems with customer services so i wrote a letter i had a phone call today from the head offices secretary she said head office had asked her to ring me, she said that pc world were in the wrong and would i be happy with £30 of vouchers to say sorry, i then said i would but i wont be shopping in pc world again but i can also use them in currys as they own that as well so i agreed and vouchers are in the post. Last edited by Dandy Lion; 08-08-2008 at 6:33 PM. That's a hand-warmer (they actually sent two, but it seemed pointless to photograph them both), and three full games (I can't play two of them as I don't own or want a PlayStation 2 or 3, but still, I was stunned by their generosity! The DS game is being greatly enjoyed, that said.). Not pictured are two shirts which they also sent - one long-sleeved Devil May Cry 3 t-shirt, and one short-sleeved Okami t-shirt. I sent a thankyou letter as soon as I recovered from the shock, of course. I recieved £3 of McCain Vouchers in the post yesterday, after emailing them to tell them how much I liked their Salt and Pepper Wedges. I only tried them in the last 2 weeks as I got a voucher (for a FREE Packet) from a promo stand outside my local tescos the other sunday. My complimentary e-mail to Mr Kipling was a success; I got a £2 voucher for Mr Kipling cakes in the post today. 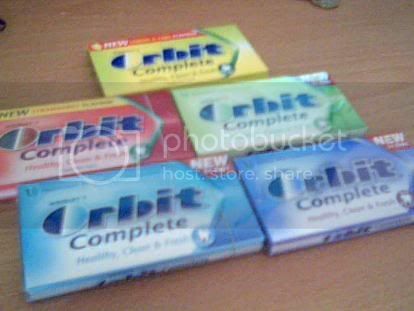 i filled out the contact form on wrigley's website saying how much i liked their orbit chewing gum and about 2 weeks later, i got five packs through the post! How about this for a reply letter to Haven? Comments would be greatfully appreciated. I have received your letter dated 04/08/08 in response to my email of 26/07/08. I have many concerns relating to your response and will outline these below. switched on the ignition pressed. cause confusion and alarm to your guests. some small battery power left). issue with the fitment of mains fed smoke alarms. light the cooker or maybe a cigarette. 1. How would you know this? Finally, you have stated that carbon monoxide alarms are not part of the fixture and fittings of the majority of the caravans and are not part of any legal requirement. fitted to these but not to all? four small blobs of blue-tack (as you can see in the attached photo). from vinyl and not in fact the wallpaper that you have also stated. Your point about the exposed wires of the alarm system once again illustrates a lack of understanding of my email and a lack of empathy with its content. You simply state that there is no power source to these wires and my point was that how were we supposed to know this. Surely you cannot possibly think it acceptable that exposed wires are left clearly visible in two separate locations without any attempt to either communicate that they are not live or to simply neatly tape them to the wall using wall coloured tape, thereby disguising them to avoid any cause for concern or confusion. Once again future owners of that caravan are of absolutely no relevance to us or to your argument. You have merely given a one paragraph reply which is simply a general answer rather than a detailed explanation of these complains in turn. Indeed, worse that this you have given me the distinct impression that actually I was at fault for not reporting these to you at the time rather than your organisation being at fault for these issues in the first place. It occurs to me that as we did not discover all these issues all at the same time I would have been making many trips to your Reception to complain! As I stated in my email I, like most people would normally just put up with issues of this nature but as I also stated on this occasion I, upon reflection felt that why should I just let it pass and that is why I eventually emailed you in great detail. Finally on this point, surely the cleaners, the caravan checkers or cleaning supervisors between them should have spotted and had corrected the vast majority of these ten points outlined above. The fact that you rely on your holidaymakers to report issues of this nature to you, means that your system of ensuring ‘fit for purpose’ accommodation has been ineffective on this occasion. What problems that we have identified in these ten points do you seriously think only present themselves through the use of the accommodation or the appliances and would not present themselves through the effective cleaning, cleaning supervision and/or caravan checking? To your knowledge how many of these issues have now been rectified? I would be most interested to find out. As you can see from my email my, T-Co complaint was of significant importance to the enjoyment of our holiday. You have accepted that your brochure states that T-Co operates throughout the season. As I stated in my email to you, this is absolutely correct because on page 202 it states that T-Co operates ‘at all parks except Far Grange throughout the season’. Please note no dates are given. and as you can clearly see the way that Haven uses the word throughout in the phrase ‘throughout the season’ is completely misleading and opposite to reality. You do imply that T-Co operates on a daily basis for the entire season by using the very word ‘throughout’. You do in effect state that, by using the very word ‘throughout’. Also, is it or is it not the case that T-Co was scheduled to take place daily from Saturday 19th July (ie. the start of the English school holidays) as my husband was informed by one of your Funstar entertainment team (on the evening of Friday 18th July – the last night of our holiday!!!). The reason she gave was that it was on every day from now because it was the start of the English school holidays. Please note I am not asking as to whether or not T-Co did in fact take place every day from 19/07/08 but I am asking whether or not it was scheduled to do so. Once again I could not have made it any clearer in my email as to the importance, especially to my son, of the virtual non existence of T-Co during our holiday but you have simply brushed this aside and have merely replied that you can only apologise for any disappointment caused. I strongly feel that the Haven brochure is at the very least misleading and am considering very seriously as to whether or not I take my issues to the relevant Trading Standards body. In conclusion as you can see I am not at all satisfied with your reply. I spent a significant amount of time and effort in compiling my original email to you and feel that you have not addressed them in sufficient detail or with any thought of any form of compensation. Neither have you fully understood my determination to get these issues resolved to my satisfaction and I feel that your overall angle has been to simply attempt to fob me off. If you look at all the issues in my first email could you seriously say that you feel we had the holiday experience Haven would wish us to have? It is all very well you apologising for any inconvenience or disappointment caused and sincerely apologising as you stated ‘IF we have failed to achieve to meet and hopefully exceed our customer’s expectations’ but the fact is you did fail to even MEET our expectations on many different levels. To this end I feel that you have totally misjudged the seriousness of my complaints and the strength of feeling that I have regarding them. I am very disappointed in your overall response and moreover am still concerned for the overall Health & Safety wellbeing of your current and future customers as you have given me very little cause for comfort regarding the key Health & Safety complains I made. Our holiday experience with you whilst, enjoyable overall, was significantly affected by the combination of the complaints I made in the email. How many other customers do you think you have that have similar experiences and never return to you as a direct result? I feel that in light of your response I have been left with little alternative but to forward all relevant correspondence from you to me and me to you (including this email) direct to your Chairman - Mr. Peter Harris and your Board Director for HR Training and Development - Ms. Ann Horner at your Head Office in Hemel Hempstead by Recorded Delivery sometime in the near future. In addition, the several points needing clarification regarding the various Health & Safety issues and Trading Standard issues may require me to contact the relevant bodies, in the near future. If you wish to communicate with me in the very near future please do not hesitate to email me for an immediate response on either address below. Last edited by angecull31; 10-08-2008 at 1:41 AM. Thanks, i've given this a try. Just a quick note, as I used to work as a oversea rep and we where responsible for health and safety checks (most areas of inspections). Ask haven for copies of these reports, also gas appliances are HIGH risk and must be serviced by qualified staff and as such have a valid safety certificate. Did you take photos and / or ask for a move? have you had a problem with these brands? I most certainly did take photos. The ones that I have sent them and a lot more besides just incase I need them later on!!! I didn't ask to be moved though as by the time that I had noticed most of these things we had all unpacked and to be honest I couldn't be bothered with all the hassle of moving, we were also hardly ever in the caravan as we were usually away on days out etc. but its the principle of the thing more than ever now. The perfect example would be to imagine going on a shopping trip to Tesco's. You would expect the shop to be perfect condition in every way ie. shelving in place and not falling down, cleanliness etc. and if there are any problems at all that they would be rectified before the shop opens for business and not that they would only get fixed if a customer pointed out the problems to them! So why should this be any different? Make as much noise about it as possible. Another thing which could perhaps help is either emailing or writing to "The Judge" at the Sunday Mail. He is very helpful at getting replies and companies dont like bad press. Keep us updated! I would also be grateful if you could give me an idea as to what to put in e-mails to companies. Thanks in anticipation that somebody will answer as I think there are a few of us now who are interested. i have recently got £15 pizza hut vouchers as i ordered a take away and it was horrible i just emailled them via there website and £10 from sainsburys as my eggs were broken and potatoes not fresh.